Beautiful Cabin in Spring Mountain Ranch. Sits on approximately 1/2 wooded acre, complete with a fire pit. Walk to golf, shopping, restaurants, private neighborhood pool, tennis and a workout facility. Perfect for getting together with family. The spacious kitchen is equipped with all stainless steel appliances, gas range, and granite throughout. Huge table seats 8-10, plus the island seats an additional 3. 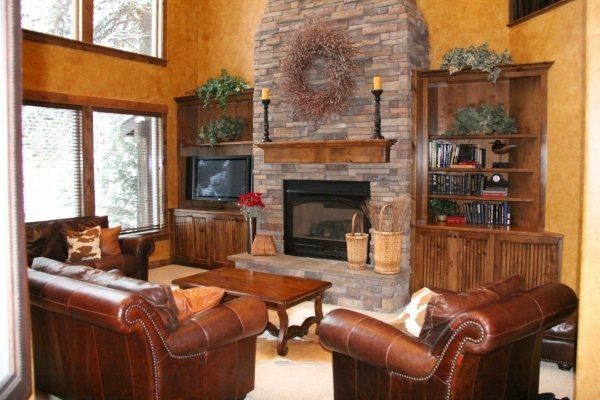 This Cabin exudes warmth and coziness, with its warm interior colors, beautiful decor, and 2-story rock fireplace. The main level master has a king-sized bed, tiled walk-in shower, walk-in closet, and a covered, walk-out deck. Upstairs, the large, second master suite has a queen bed, full bath, walk-in closet. Bedroom #3 has queen bed, and bedroom #4 has 2 sets of bunk beds, one of which is a twin over full. The second floor also has a huge bonus room, with large sectional that folds out into a sofa bed. Bonus room also has 50' plasma TV with surround sound. Complete 3 car garage, with additional parking on side of house. We are the Hall Family. We have enjoyed our cabin in McCall so much since we built it. We are pleased to be able to offer it and all the wonderful amenities McCall has to offer to you. We hope you enjoy your stay in our cozy cabin and will take advantage of all fun things there are to do close by! We custom built this property to accommodate multiple families while vacationing. The spacious bonus/movie room upstairs entertains the kids, while downstairs the adults relax with a cup of Hot chocolate next to the cozy rock fireplace. Or, enjoy listening to the crackle of the outdoor fire pit while roasting marshmallows for smores. Very few places here in McCall exhibit the warmth that the Drake Lodge does for its guest. Come and experience it for yourselves!! The Drake Lodge has access to the Spring Mountain Club House, Pool, Fitness center, Sauna, and Tennis Courts. We are 1 street away from the 7th hole on the McCall Municipal Golf Course. Great Biking Distance to the Lake. Beautiful Payette Lake, Within Walking Distance from front door. Fast Wireless Internet is available. Wonderful outdoor fire pit, perfect for roasting marshmallows, Hot dogs. Built in benches great for getting together with friends and family. We loved this property for our family winter trip. It was great for our big group with tons of room for people to get away from the noise, too. I was very thankful for the playpen and highchair to lighten my packing list. Honestly, the pictures don’t do this place justice, it was great! Lots of space for a large group, fully equipped kitchen and nice indoor and outdoor spaces. Easy access to the pool, and gym facilities; and quick drive or bike ride to the Lake. Beds were comfy with lots of storage in each bedroom. It was nice to have a high chair and some toys for the little ones.... and we all enjoyed the wildlife that came and went through the property! My family all commented that the photos did not due this cabin justice-it had a great mountain house feel. Would book again and try to stay there in the wintertime as well. Appreciated Juston’s accessibility to answer our questions both before and during our stay. Thanks for your kind words about our Dream Cabin in McCall and Yes it is an awesome town and a great place to spend vacation days and nights here, especially in the Drake Lodge. Come again and try us when there is a bunch of white stuff outside. Thank You. Come Again. Juston. Spent 3 nights with friends at this lovely home. The layout was perfect, the beds super comfortable and I was surprised how well stocked the kitchen was. The deer greeted us every morning in the yard and seemed quite at ease. Even though the house is not on the lake, it is a very short drive or walk to town. The house was everything we were looking for and we would highly recommend this property the next time you're visiting McCall! Spent five nights here and didn't want to leave. Plenty of space. Both bedrooms and bathrooms. Nice yard, firepit, grill, hot tub, toys for the kids, a theater room, AC, it has it all! Nice comfortable property with everything we needed. Close to town and very quiet, deer and squirrels were added entertainment. Thanks so much for your stay! We are so glad you enjoyed your stay and felt comfortable at our place and had everthing you needed. Please feel free to come back soon. McCall is such a small little town, but has all the ammenities one would want on a vacation away from where ever your coming from. Majestic mountains to hike and bike too. Great Lake to ski or fish on. Cliff jumping minutes away. Great hiking trails to pick Huckleberries and explore the Idaho Mountain ranges. No parking vehicles in the Garage during wet snowing Months. As we have carpeted our garage to allow the kids to use it during the winter! Remove bed linens and wash and Dry a load of Towels.